29:32 Show Notes: Hurricane Sandy, Future prepping changes. Making a strategic relocation. Released November 2012 on The Overnightscape Underground (onsug.com), an Internet talk radio channel focusing on a free form monologue style, with diverse and fascinating hosts. 1:30:04 – Escapism is the topic and expert commentators Frank Edward Nora of the Overnightscape. Eddie Murray of Cloud Base 44, Wayne Reichert of Sparetime Radio, and Chad Bowers of Chadcast join forces with host, PQ Ribber. 1:58:01 – Eddie from Cloud Base 44, Frank Edward Nora. Chad Bowers, Geoff Sink, Wayne Reichert, and Mike Boody contribute to another epic gathering of the finest internet radio hosts! PQ Ribber hosts and informs you how YOU can participate, next week, when the topic is: Writing! 1:29:20 – Heat and insanity with Shambles Constant, Carrie Michel, Frank Edward Nora, and Wayne Reichert!! PQ Ribber is your deranged host. 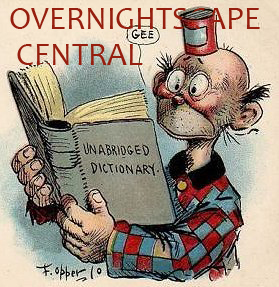 Released January 2012 on The Overnightscape Underground (onsug.com), an Internet talk radio channel focusing on a free form monologue style, with diverse and fascinating hosts. 36:17 Show Notes: Long Car Trip, What Does 2012 Hold For Us, Gas Station Convenience Stores, I95 Cuisine, What My Internet Sources Say, The Government Won’t Forewarn You, Ultimate Warrior Promo. 31:22 Show Notes: Loud Mouth, North Carolina Christmas Road Trip, Latest Art Piece, No Empathy, Quest for the Silver Eagle, New Currency on the Horizon?, Precious Metal Gamble, Young Kids Being Suspended for Normal Activities, ONSUG on Fire, 100 Episode Fail, Squirrel Hunter, Think Your Vote Counts?, Dire Warning From Ron Paul, Dylan Ratigan Rant. Released December 2011 on The Overnightscape Underground (onsug.com), an Internet talk radio channel focusing on a free form monologue style, with diverse and fascinating hosts. 33:44 Show Notes: Quest to Reach 100 Episodes, The Walking Dead TV Show, Dexter Season 3&4, YouTube Favorite Conspiracy Channels, End Times?, Gold & Silver Buying Shops Popping Up, Protests being Disbanded, Sound Cannons, Killing Cancer Cells Using Specific Tone Frequencies, Pulled Over By The Police!, Going to the Police Station! Art Talk and Circus Freaks, Sleep and Dreams, Applying Oneself . 18:05 Show Notes: Brad Meltzer’s Decoded, Georgia Guidestones, 2012, What Keeps Me Up at Night. You are currently browsing the archives for the 'Wayne' category.